Many of you will know that the exact location of Miss Loi’s Temple is shrouded in secrecy, known only to students who have signed up for her tuition classes. Miss Loi is not trying to be all mystical or funny. She hopes everyone can understand that as more people get to know about this blog, and being a delicate person with a timid heart, she would like to preempt the possibility of some un-student-like stalker (apart from their parents) appearing unannounced at her doorstep. Unfortunately, despite being given the exact coordinates, some students are destined to get lost among the wilderness of Novena, and in danger of being waylaid and devoured by wild beasts in the form of other tuition agencies in the area (just joking here – no offence to any tuition centers in Novena!). To that end, she has put up a series of signage for the purpose of guiding her flock of lost sheeps to the correct destination. 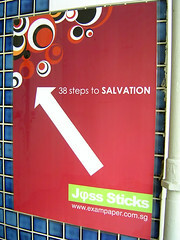 You will see this sign soon after you exit from Novena MRT Station and turn round a corner. At this point you should be able to feel a gentle breeze of serenity upon your face as, indeed, salvation is near. And yes, there really are 38 steps you need to climb. 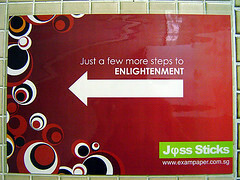 Halfway through your arduous 38-step climb, this second sign reassures you that you are indeed on the right path to enlightenment (and not on a wretched road leading to the wrong tuition center *joking again*). When you see this, you are standing just beyond the sacred Temple Grounds. The pull on your Mathematical consciousness by Miss Loi’s presence emanating from within, can be rather overwhelming at this spot. Finally. Looming before you are the mighty Temple Gates, where a mere glance at them is enough to reduce straight-As students to tears. The aura surrounding you here can be blinding, as you suddenly experience a positive surge of Mathematical prowess. Pause, look in awe and pose for a few touristy photos while you can. Now step inside, lots of joss sticks are waiting to be burned! 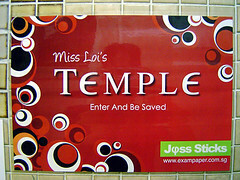 Miss Loi’s Temple Goes Private! Miss Loi’s Temple is Under Water! And they really look quite pretty, not those done in MS Word type. Thanks hendri. Just hope that this will not attract any unwanted attention from the owners of the many, many 'done in MS Word types' in the vicinity! chanced upon this site and my, i really love the way u write! Heys Miss Loi, I really liked the directional signs you put up! They looked really professional. Glad you liked them BR. Must also thank the Bras Basah printer for the good print job! Wow. Any more tips from the Advertising Guru? EH now you become so pro! Maple: No choice. Spent long talktimes on the phone directing lost students wandering in the vicinity. So the signs have to be eye-catching enough, else there will be more and more wandering around in the vicinity looking 'stoned'! Clarion, Miss Loi has a nagging suspicion that your relief teacher might be this guy. But Greek mythology? This blog has only Greek symbols aplenty! no, he is NOT the guy you suspected. And do you want his blog URL? P.S. These days, never believe anyone if he tells you he's impoverished. anyway, miss loi, how to buy the LV collection of exam papers? BTW, after reading all that crypto stuff on your link confirm chop stamp your cher's not BlabberingMe! Yup so how do you find him? Need arrange mahjong session to erm... lia2 luo4 not? PS Your 13 wonders probability question I ask him solve ler. I am a desperately seeking a knowleagable maths teacher. Have tried out numerous " part-timers" but none works. All they care is to complete 8 lesson and get their salary. My daughter's maths result is deterioting fast. I am desperately seeking a maths teacher. Have tried out numerous " part-timers" but none works. All they care is to complete 8 lesson and get their salary. My daughter's maths result is deteriorating fast. Please call 9380 5290 asap to discuss your daughter's case. 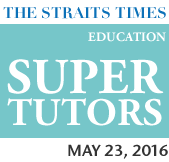 thinking of finding a tutor to consult. My math teacher don't really teach well. from the other ban asked her. great comments on your teaching! fees n schedules for the tution you provided. hurray! i have found your temple after scouting around for 30 minutes in novena following the hints from the post =) quite hard to find leh! Evon: You're very free hor? Mids over for you? 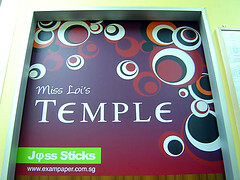 Only found the huge posters of Miss Loi on the walls of The Temple! Hi!Miss loi.Ive been to so many tuition centre but nothing work and i seriously need your help to improve my maths.Can u help me? And im willing to work hard if u are going to teach me? Ahhh ... finally a Jap expert is here for an external audit. Actually がんばって! is meant to be Ganbatte! according to an online translator. Does that make any sense to you? If it doesn't, what should it have been? And what's with that リオィー先生??? Mr Loi??? came across this website while yahooing for tuition centre .. spend almost 2 hrs scouting around Novena MRT for Ms Loi signage, but found NONE .. even asked the MRT staff, don noe was the answer .. tried calling, keep getting voicve mail, no good ... i believe the signage has been removed or have u relocated .. or what ..? appreciated it very much if you could drop me a line .. thank you ..
No, The Temple (and its signs) is still sitting tightly in Novena but if you've read the latest blog entries you'd realise that Miss Loi is currently overseas (in fact she's in transit at Qatar International Airport as she types this).